Hello everyone. We recently had a tree placed in our yard by a landscaping company. 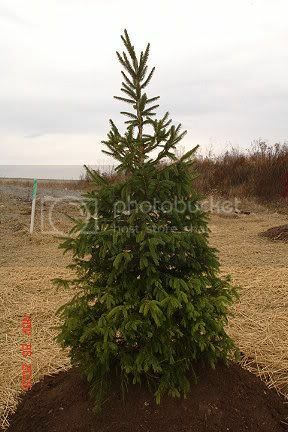 After doing some research on Wikipedia, I think I may have narrowed down the search of what type of tree we have to being a Fir tree, but don't know the exact species type as there were alot of them listed on Wikipedia. If someone could help me further ID the tree and what its species type is, I would be very thankful to you. It is very hard to tell these two apart because the needles and such are so alike. The only good identification separator is the cones. What do the cones look like for both those type of tree? When should we expect to see cone growth on the tree? Are they hearty trees during winter months? Or could the tree possibly be a spruce tree? And if so, what type of spruce tree? There is no "blue" tint to the needles on this tree. Cold hardy, sure. The big question is whether or not it will tolerate long periods of hot weather. It might help to get some very close up pictures of the needles and maybe the bark also, might help with identification. The trees produce its first seeds when it is around 20 years old. Your tree looks at least 12 year old and maybe as old as 16 years. Firs are very cold tolerant and are native to high mountains usually or in a northern climates. 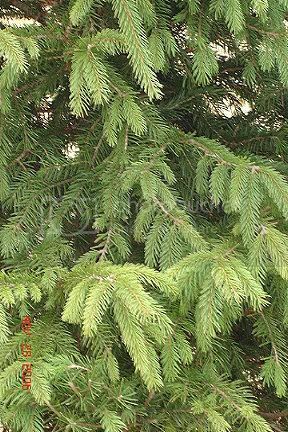 Balsam Fir has a hard time if temps get above 86 for more than 30 to 40 days. And they are best grown from northern Ohio north. Fraser fir has a greater heat-tolerance and would probably do pretty good in KY. I'm not so sure anymore that the tree is a Fir. I went to a Home Landscaping class yesterday at our local Agriculture Extension Office and asked the class instructor (who owns a Nursery) what the picture of the tree looked like. He said he thought it looked like a Norway Spruce. It should be easy to tell if it is Spruce or Fir at least. Spruce needles are 3-angled and the cones hang down. Fir needles are flat (somewhat fleshy compared to spruce) and the cones are upright. I realize that this tree is too young to have cones, but you should be able use the needle feature. Where did you get it from? Unless this was picked up at a Christmas tree stand then in all likely hood it's a Norway spruce. The spruces are much more common to find in cultivation. For what it's worth I have balsam firs growing in containers here in GA and they have survived last summer which was brutal without any complaint. Of course what might not be so evident is resistance to pest and disease which could cause them to possibly not be very long lived even if they manage to survive for several years. We got the tree from the Landscaping Company that works for the builder, that built our new house.